Image © Ahoy Comics. Main story written by Tom Peyer, art by Jamal Igle and Juan Castro, colors by Andy Troy, letters by Rob Steen. Backup written by Paul Constant, art by Frank Cammuso. Additional material by Grant Morrison and Shannon Wheeler. I must say up front that I’m working for Ahoy, doing their logos, so while I’m certainly wishing them well, I’m not involved in the interiors, just reading along like most of you. This book begins with a clever idea: two versions of the same heroes and villains, one in a world reminiscent of today’s grim and gritty heroes, one in a Bronze Age comics world where things are brighter, happier and safer. Then the heroes get switched. Their reactions to a world they never made are entertaining and sometimes funny, but it wouldn’t work unless we empathize with the characters, and I did. I think it works well both on the writing and art. The backup featuring the Bronze Age boy sidekick is fun, and I like the cartoonier art and old comic approach of Frank Cammuso, but there’s one thing that pulled me out of the story: the lettering. It’s perfectly readable, but it uses the crossbar (serif) I everywhere instead of just in personal pronouns like I, I’ve and I’m. This is a rookie mistake. Tom Peyer, why was it not caught? I enjoyed the story anyway. The text piece by Grant Morrison, along the lines of the ones that used to appear in old comics that didn’t have letters pages to gain second class mailing permits, is a hoot. Robert Kanigher on acid? The one-pager by Shannon Wheeler is fun, too. And there are interviews with Peyer and Igle. 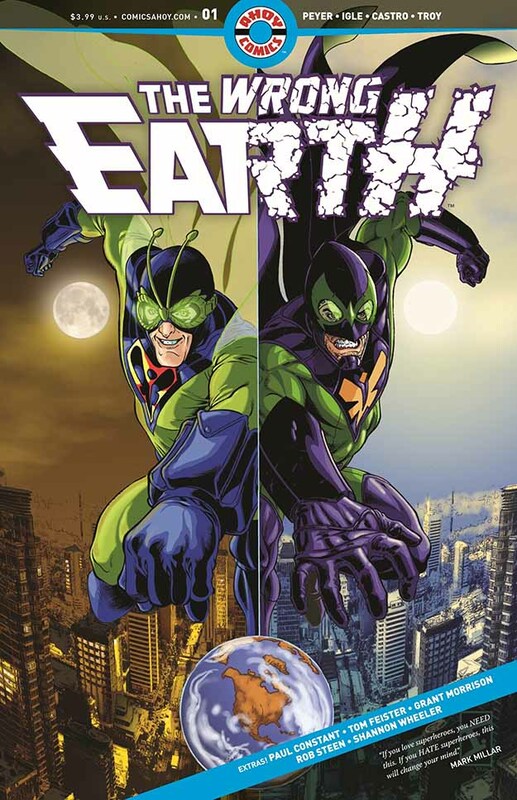 This entry was posted in Comics, Reviews on October 4, 2018 by Todd.